The hAP ac is our most universal home or office wireless device. It is a dual band device with Gigabit ports that allow the full advantages of 802.11ac technology speed, while maintaining compatibility with legacy devices in 2GHz 802.11 b/g/n and 5GHz a/n modes. The omnidirectional antennas allow to mount the hAP ac in any location, and the high power transmitter will ensure good coverage for the mobile devices in your home, office or public location. 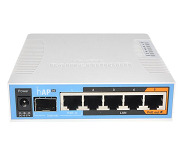 Other helpful features include a USB port for attaching extra storage or a 3G/4G modem, PoE output on the last Ethernet port, to power other RouterBOARD devices without needing an extra power adapter and an SFP cage, for connecting active or passive optical network modules. We have two versions available. - RB962UiGS-5HacT2HnT-US (USA) is factory locked for 2412-2462MHz, 5170-5250MHz and 5725-5835MHz frequencies. This lock can not be removed. - RB962UiGS-5HacT2HnT (International) supports 2412-2484MHz and 5150MHz-5875MHz range (Specific frequency range can be limited by country regulations).